It's cranberry season in Washington! Our little neck of the woods is one of the top producing regions of the tart little berry and it's no surprise that we love them around these parts. Whether we're making cranberry sauce, tossing some into baked goods or using them in our decor - everyone has their own way of showcasing these crimson berries. And here are two of mine. First up is one of my all-time favorites. I'm not much of a breakfast eater, but a good cup of coffee and a pastry? Now that'll get my engine purring in the morning. 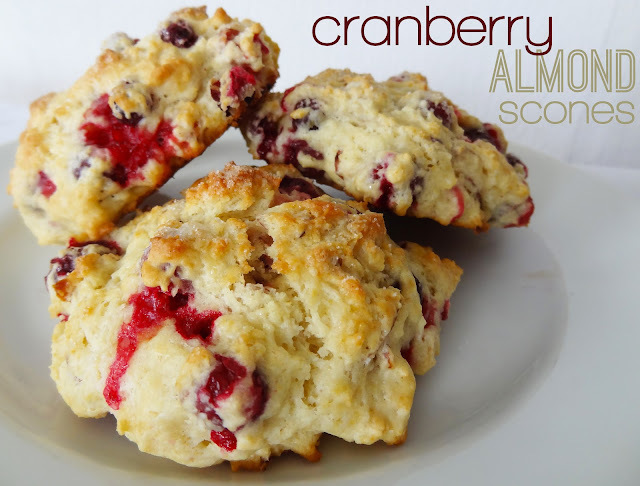 These Cranberry Almond scones are quick and delicious. 'Nuff said. Preheat oven to 425ºfF. Sift flour, sugar, baking powder and salt. Cut in the butter, until the mixture looks like meal. Mix in the cranberries and almonds. In a separate bowl, combine the eggs, milk and almond extract. Stir into the flour mixture just until evenly moistened. Drop dough onto a non-greased baking pan. Sprinkle a good helping of sugar on top. 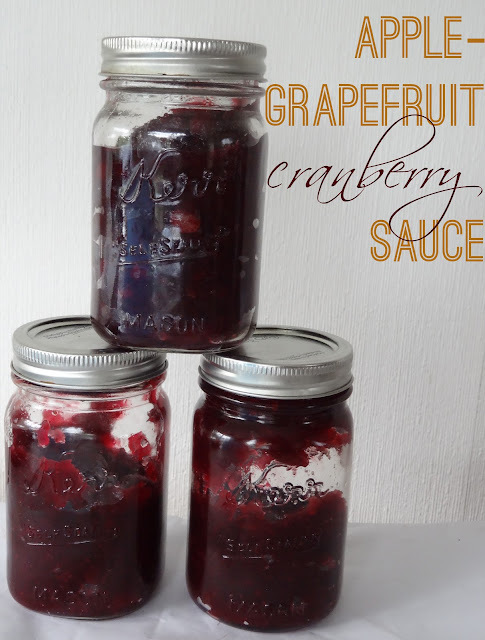 Next up is my go-to recipe and a tradition at our Thanksgiving meal - cranberry sauce. This ain't no run of the mill cranberry sauce, either. Williams-Sonoma shared their Apple-Orange Cranberry sauce recipe and it's been a hit around our table. I can never seem to make enough come November so with a ton of cranberries on hand I canned some in preparation for the big family meal. This year's cranberry sauce got a little twist when I subbed grapefruit for oranges since that's what I had on hand and I'm pretty pleased with the results. Zest half of a grapefruit. Combine the zest and the water and bring to a boil. Cook for 10 minutes, then drain and set aside. Peel, core and quarter the apple. Cut into 1/2-inch dice and place in a saucepan. Sort the cranberries, discarding any soft ones. Juice half the grapefruit and add to the apples along with the grapefruit zest, sugar, cinnamon and nutmeg. Bring to a boil over high heat, reduce the heat to low and cover the pan partially. Simmer gently, stirring occasionally, until the sauce thickens, the apple is tender and the cranberries have burst, 15 to 30 minutes. Transfer the cranberry sauce to a heatproof bowl and let cool for 1 hour before serving. Or cover and refrigerate; bring to room temperature before serving. Honestly, good luck trying to get away with just using the canned stuff after your family and friends try this! So there you have it. Two mouth-watering cranberry recipes perfect for the upcoming holidays. Those cranberry scones look like a must try! Thanks for stopping by, CJ!